We woke up to rain, high winds and cold 40 degree weather. In spite of this we took the free casino bus to Harrah's on the Las Vegas strip. How wrong I was to think we would have the place to ourselves. The crowds were huge and everywhere. There must be direct flights from Japan to Las Vegas. The architecture of the strip is just a massive jumble of different styles, electronic signs, and fiberglass sculptures. It's much worse than Disney World. We toured the fancy shops in Caesars Palace and the Bellagio. Sony had an exhibit of 3D TV that requires special electronic glasses to watch. That's the next I got to get one. The casino floors are so large as you walk through you wonder if you will ever get to see the light of day again. The water show at the Bellagio is well worth a visit. 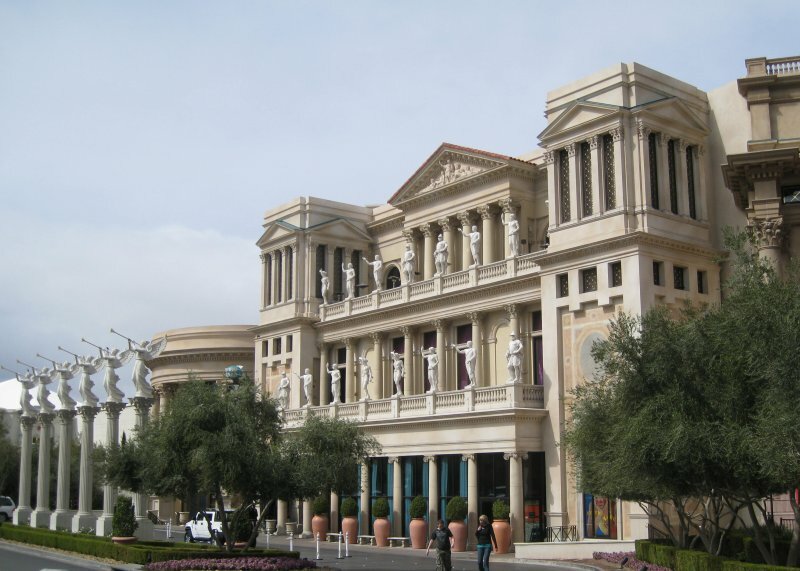 The photo shows one of the buildings at Caesar's Palace attempting to imitate the Louvre. The city has come a long way since my last visit around 1986.